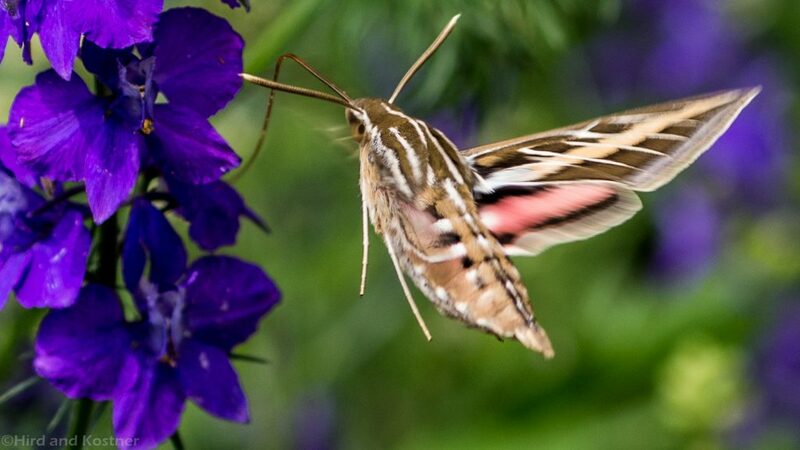 The White-lined Sphinx moth is one of our more unique and interesting visitors to Lepidoptera Buffet. The ancient Latin word lepidoptera literally translates to scaly wings. 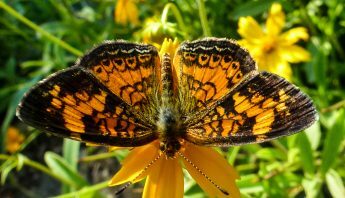 Lepidoptera are the biological order of 155,000 species of butterflies, moths, and skippers. 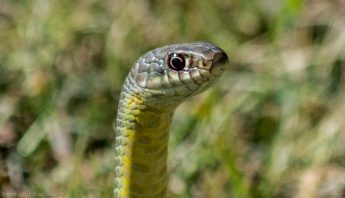 These insects emerge from caterpillars, have 4 wings, bodies covered in scales, and use a tube-like proboscis in order to eat. Each insect of this order is unique in appearance because the scales covering the wings are really just fine hairs, modified and flattened. As light bounces off each scale, refracted light gives each lepidoptera a unique appearance of markings and colors. 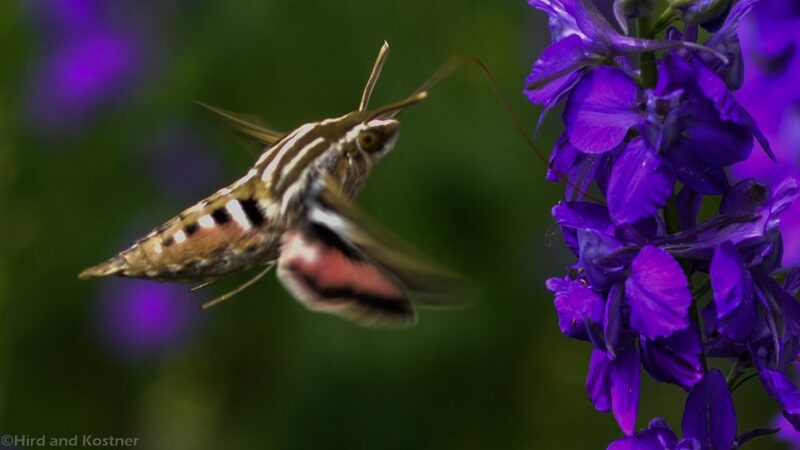 A member of the family Sphingidae, Hyles lineata is often called a hummingbird moth and sports distinct banding along the thorax of drab tan, black, and white accented with bright pink just above the dark median band across the hind wing. These markings appear in sharp contrast against the deep blue Delphinium flowers. It’s the only pink moth at Lepidoptera Buffet! 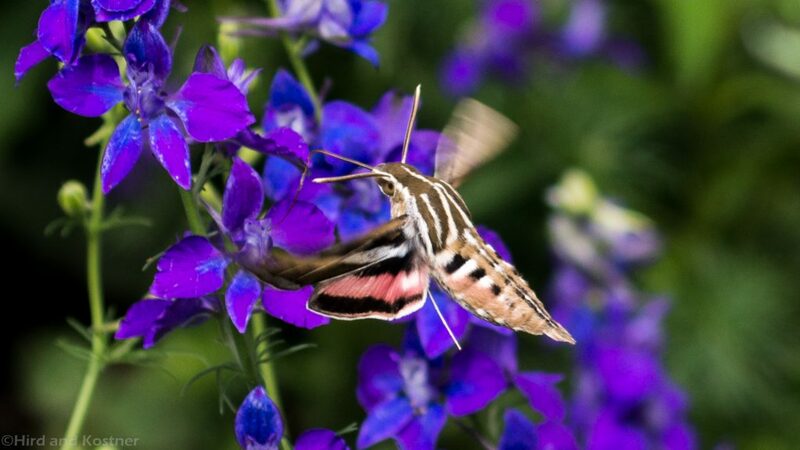 This self-seeded patch of Delphinium and Larkspur provides an abundant source of spring and early summer nectar for newly emerging pollinators like this stunning White-lined Sphinx moth. 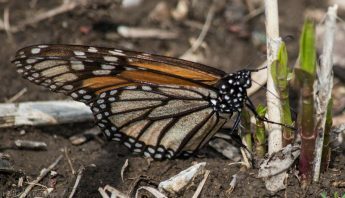 This gives pollinator farmers endless, quiet hours of satisfying entertainment—far surpassing any electronic device on the market today! It is an honor and a privilege get to observe the many pollinators coming to dine at our Lepidoptera Buffet gardens; this is our finest reward for the often intense, energy output that is required to grow local host and nectar foods. 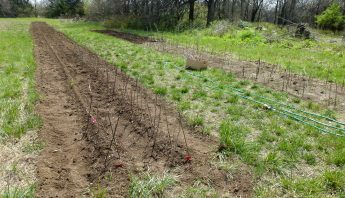 Once a garden gets rooted, perennials and self-seeders take over some of the hard work by replenishing themselves each year. A garden filled with nectar-rich flowers such as Four O’Clock, Honeysuckle, Petunia, Columbine, Delphinium, Larkspur, Lady in Red, Milkweed, Black and Blue Salvia, Moonflower, Obedient Plant, and Butterfly Bush will certainly attract the White-lined Sphinx moth. Confused about the difference between butterflies and moths? Look at the antennae! Moths have feathery or saw-toothed antennae whereas butterflies have club-tipped, round-shaft antennae. These large moths have a wingspan of 2.5 to 3.5 inches. 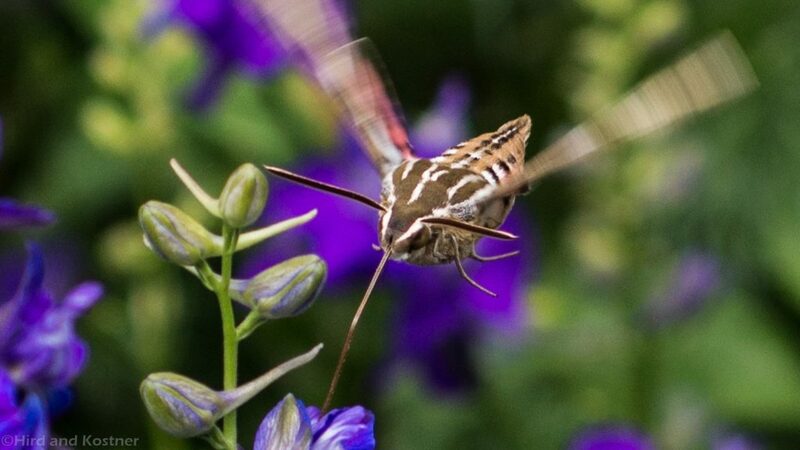 With high-speed flapping wings, they can hover in place much like a hummingbird, which is why they’re sometimes called a hummingbird moth. The long proboscis remains coiled up until hovering near a favorite flower such as this deep blue Delphinium. 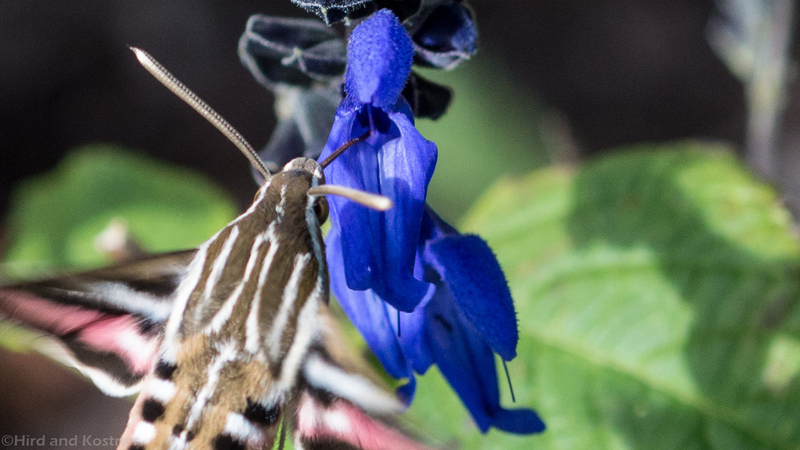 Moths drink nectar from plants with tubular flowers—like Honeysuckle and the different salvia flowers. 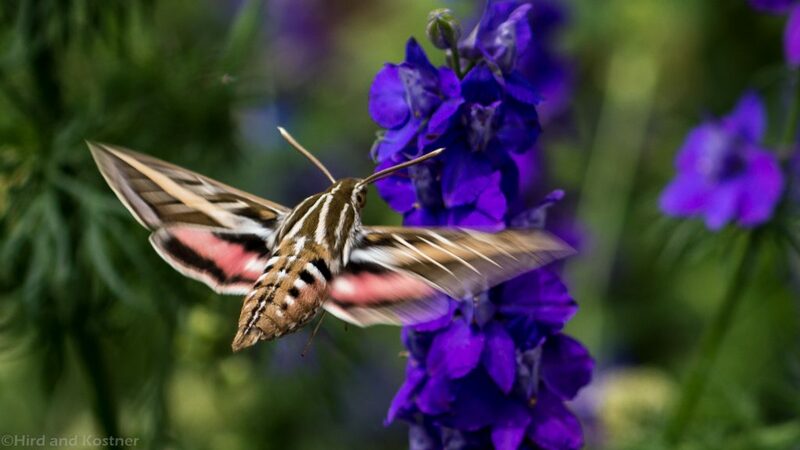 The Sphinx moth has very distinct markings along the body of drab tan, black, white, and the deep pink along the hind wing median band stands out against the rich colors of the Delphinium flowers. 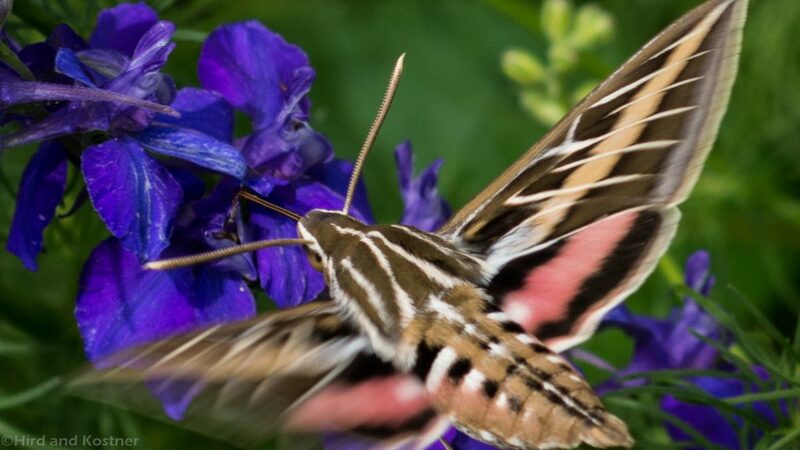 The White-lined Sphinx Moths most often visit nectar flowers in the cool of dawn and dusk. This moth appeared in the late afternoon, fluttering around the blossoms clustered up these Delphinium plants. This particular patch of flowers developed from one plant, self-seeded into hundreds, and attracts many different pollinators. 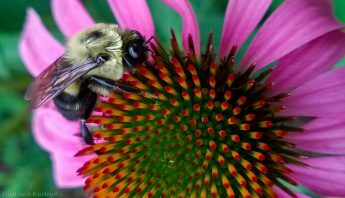 When planting a pollinator garden, it is important to provide ample food sources ranging from early spring to fall frost. 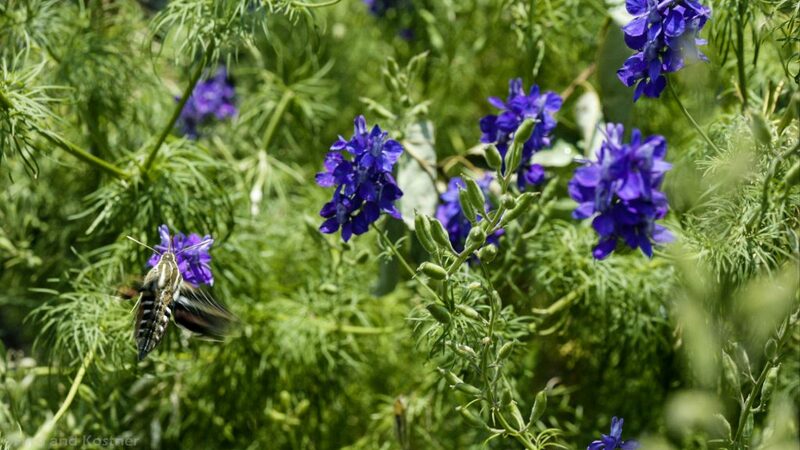 Larkspur and Delphinium blooms last until the start of the summer blooming flowers. 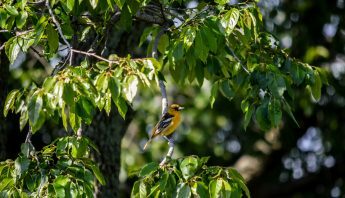 While we sat outdoors, sipping iced tea in the cool shade of the old persimmon tree, the sounds of softly flapping wings floated up from the purplish blue sea of flowers clustered along tall spikes. This was one of those perfect moments in time as the glowing sun spilled a soft, golden light upon God’s beautiful creature. Pollinators gravitate towards flower blooms with tubular structures that match the length of their proboscis. 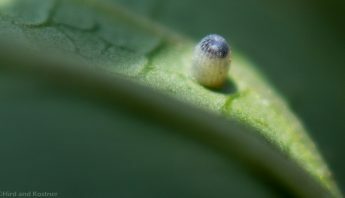 The moth inserts the long proboscis into the rabbit-head flower bloom, replete with precious nectar; the moth uses this tube-like structure to draw liquid like sucking on a straw. With an abundance of host and nectar plants, the creatures who dine upon these plants will certainly appear. Some of the local host plants to attract these beautiful moths includes clover, purslane, evening primrose, apple, Fuschia, Four O’clock, elm, and our precious tomato plants. Tomato hornworms become Sphinx moths and have a voracious appetite that will quickly strip tomato plants. After many discussions on the merits of plant-sharing with the tomato hornworms, we simply move these horned caterpillars to their own plant, thus leaving the rest for ‘maters! 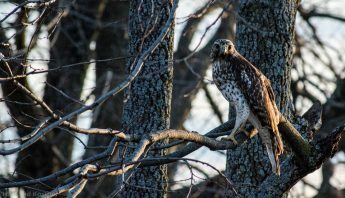 Share this post with nature lovers and visit our “Facebook” page. 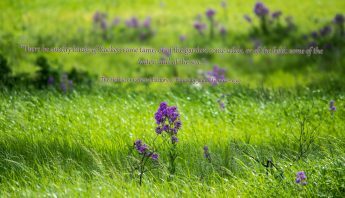 © Hird and Kostner | Image reproduction only with written permission from the authors. Images in this website available as stock photography. Reproduction with written permission.